The new USB Type-C cable has a connector similar in size to a micro USB but has a symmetrical shape, this allows you to plug the connector in either way up. This cable features both a Type-A connector and a Type-C connector making it the perfect solution for connecting modern mobile devices with a Type-C connector to a PC that doesn’t have a Type-C socket, only a standard USB connection. Our cable supports up to 20V / 3A (60W) of power. The new improved power delivery allows you to charge not only small mobiles devices such as mobile phones and tablets, but also laptops. Click Buy now to see all options. The Micro KVM Switches come complete with attached cables allowing users to access two computers using 1x Monitor, 1x PS2 Keyboard and 1x PS2 Mouse. The KVM-664 Model allows 2x PCs, MACs or combination of the two (USB connection) to 1x Monitor, Keyboard and Mouse. These Micro KVM Switches were designed on the principal of size matters. This is one of the smallest KVM Switches available. Two cables (1x 1.8Mtr 6ft and 1x 0.6Mtr 2ft) are supplied moulded to the switch with a uniquely styled strain relief that can be used to attach the Micro KVM Switch to a desktop or wall to protect the Micro KVM from damage or dirt. No interface card or software is needed, Installation is as easy as connecting cables from the CPU Switch to your computers. Operation is as simple as entering hot-key commands from a keyboard. The Micro KVM Switch is independent of computer operating systems. Profigold PROM6402 High Speed FireWire 400 IEEE1394 Interconnect 2m. Up to 400 Mbps data transfer between computer and device Complies with the FireWire 400 IEEE1394 standard for unmatched performance White ultra-flexible PVC cable jacket for ease of handling Slim-line plug design for maximum compatibility with portable equipment Superior grade 99.996% oxygen-free copper to guarantee lowest signal loss. 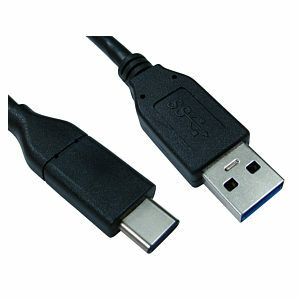 3m USB Extension Cable, black, type A male to A female, ideal for extending a USB cable with a USB type A connector. Colour black Compatible with USB 2.0 and USB 1.1. Parcels and Visitors are NOT accepted at this address. © Copyright 1980-2019 TVCables All rights reserved.